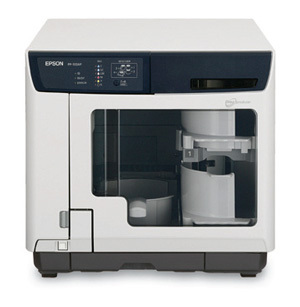 The Epson PP-100AP Autoprinter has been touted as one of the best printers in speed, reliability, and quality for semi-professional printers. Released in January of 2010 by Epson, one of the leading manufacturers of inkjet printing, the Autoprinter has quickly become one of the most ideal solutions for printers who need rapid, large-batch printing at the quality of a professional printer but without the cost. With four trays, the Autoprinter is capable of finishing up to 95 CD or DVD discs in an hour on the fast print setting, and up to 50 to 75 discs on the higher quality print settings – considered remarkable speed and efficiency for its size and cost. Epson’s sealed patented AcuGrip robotic technology moves the discs from station to station to prevent damage during printing. This printer even offers the novice printer easy-to-use software and templates for print jobs without a prescribed design format. The Autoprinter houses six printer cartridges that allow for more than 1,000 discs to printed before changing one cartridge, and, when that time comes, printers can save on printing costs by only needing to replace one cartridge at a time. For the more advanced printers, with larger print jobs, up to six printers can be controlled by just one computer. Windows XP SP2 or later 32-bit Home Edition, Professional. Windows Vista SP1 or later 32-bit Home Basic, Home Premium, Business, Enterprise, Ultimate (When using Vista, use Total Disc Maker Version 1.5 or later). For the second year in a row, SanDisk director, design engineering, Cuong Trinh, has been a distinguished guest at the IEEE International Solid-State Circuits Conference (ISSCC) held this year From Feb. 7 to 11 in San Francisco. After delivering a paper last year to the conference titled “A 5.6MB/s 64Gb 4b/Cell NAND Flash Memory in 43nm CMOS” Trinh has been awarded the ISSCC 2009 Lewis Winner Outstanding Paper Award. The ISSCC award recognizes SanDisk, a leader in flash memory cards, for its development of the patented X4™ technology, which achieves four-bits-per-cell using superior memory management, signal processing schemes, and powerful error correction code. The X4 technology has been known to perform well and is relatively low in cost. “The fact that SanDisk has received two consecutive ISSCC Outstanding-Paper Awards is a dramatic demonstration of their continuing breakthrough research,” said Dr. Kenneth C. Smith, ISSCC Awards/Recognition Chair, in the SanDisk press release made public February 9. This award could be just what the company needs after experiencing a significant drop in share prices last month. Shares took a 9-percent drop after the company projected its earnings to be weaker than expected. But have no fear SanDisk, some experts say. The sudden stock-price drop may be less worrisome than it seems. For the first time ever, SanDisk founder and CEO, Dr. Eli Harari, hinted at a possible formal relationship between SanDisk and Apple, which already sends millions of dollars in royalties to the flash-memory technology company, after its announcement of the iPad. Harari actually told Reuters that after attending the iPad unveiling he was “all smiles” because of the device’s potential to “create a huge demand for flash.” While this isn’t a clear indication of a signed contract, speculators only have to wait a few months for the iPad release to find out which technology Apple chose for its tablet computer’s inner components. If history is any indication of the future, SanDisk’s selection for Sony and LG computers may be a good sign for the company.